Ever since we met him in Harry Potter and the Sorcerer’s Stone, Garrick Ollivander has been one of the most interesting and mysterious characters in the entire series. A gray-haired man with a clear gift for both wand-making and wand-matching, he has a reputation for being the best at helping wizards and witches find their perfect magical match, particularly those in the London area. Which, when you stop to think about it, means this guy has probably met almost every single wizard and witch who has ever attended Hogwarts. Even though we only get small nuggets of interaction with him, he’s totally intriguing. This guy has surely got some stories to tell. His name is said to mean “he who owns the olive wand,” which means his oldest ancestors probably came to Britain from a Mediterranean country. People travel from all over the world to buy a wand at Ollivander’s. 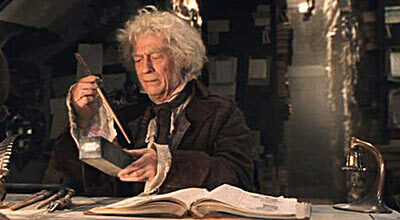 Ollivander basically revolutionalized the wand core game, NBD. It’s a delightful read for people anyone thirsty for more knowledge on this fascinating guy or just interested in what makes those little sticks of wood so truly powerful after all.